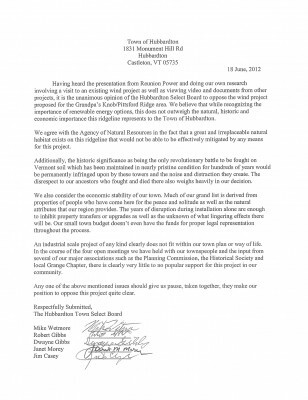 Having heard the presentation from Reunion Power and doing our own research involving a visit to an existing wind project as well as viewing video and documents from other projects, it is the unanimous opinion of the Hubbardton Select Board to oppose the wind project proposed for the Grandpa’s Knob/Pittsford Ridge area. We believe that while recognizing the importance of renewable energy options, this does not outweigh the natural, historic and economic importance this ridgeline represents to the Town of Hubbardton. We agree with the Agency of Natural Resources in the fact that a great and irreplaceable natural habitat exists on this ridgeline that would not be able to be effectively mitigated by any means for this project. Additionally, the historic significance as being the only revolutionary battle to be fought on Vermont soil which has been maintained in nearly pristine condition for hundreds of years would be permanently infringed upon by these towers and the noise and distraction they create. The disrespect to our ancestors who fought and died there also weighs heavily in our decision. We also consider the economic stability of our town. Much of our grand list is derived from properties of people who have come here for the peace and solitude as well as the natural attributes that our region provides. The years of disruption during installation alone are enough to inhibit property transfers or upgrades as well as the unknown of what lingering effects there will be. Our small town budget doesn’t even have the funds for proper legal representation throughout the process. An industrial scale project of any kind clearly does not fit within our town plan or way of life. In the course of the four open meetings we have held with our townspeople and the input from several of our major associations such as the Planning Commission, the Historical Society and local Grange Chapter, there is clearly very little to no popular support for this project in our community. Any one of the above mentioned issues should give us pause. 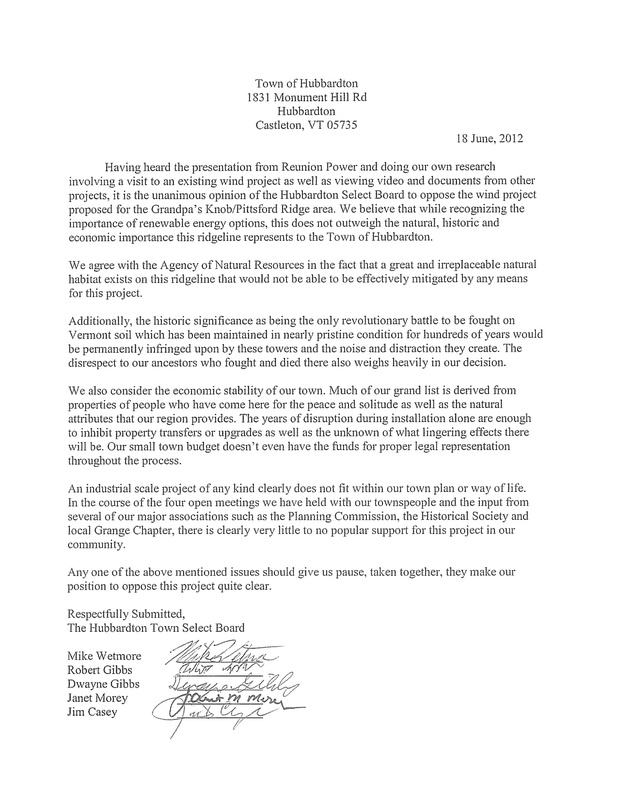 Taken together, they make our position to oppose this project quite clear.